By chance or perhaps my natural gravitation, I just completed a sort of hat trick – meal accompaniments from three of my favorite Burgundy producers, all of whom fall into the somewhat misunderstood category of négociants. The term refers to producers who purchase as at least some of their grapes from vineyards they do not own. Though it is an old business tradition among some Burgundian wine companies, I’ve always had the impression that many enthusiasts regard the tag “négociant” as if it were an asterisk indicating that wines from the marked producer were somehow suspect – not purely evolved from domain vineyard to labeled bottle. This is simply a wrong-headed view of the concept. Some of the most highly regarded winemakers in Burgundy direct operations at négociant houses that have given me great pleasure for as long as I’ve been collecting wine: Joseph Drouhin, Maison Louis Jadot and Domaine Faiveley. And while Burgundy prices have shot up across the board, I continue to find good values from all three. They also all produce a wide range of wines, from inexpensive village bottlings to top-flight grand cru. Typical of Burgundian négociants, Drouhin, Jadot and Faiveley all own vineyards in the Côte-d’Or, the region’s prized heartland. Moreover, as eminent négociants of long standing, these three are likely to have considerable influence over management of other vineyards from which they acquire their grapes. But the proof is in the bottles, and lately I’ve pulled the cork on some beauties. These are older wines, available mainly at auction, if at all. But in each case I have noted the typical price for the current vintage. Joseph Drouhin, headquartered in Beaune, made big news in the U.S. back in 1987 when it purchased property in Oregon’s Willamette Valley to produce Burgundian-style Pinot Noir. That venture, directed from the start by Véronique Drouhin, has become an American source of Pinot Noir strikingly similar in style to the parent company’s elegant, light-bodied but deeply flavorful wines. If there’s a defining Drouhin red from the Burgundian homeland, it is the premier cru Beaune Clos des Mouches, an old favorite at our table and the wine that launched my recent négociant cycle. It was a 1995 Clos des Mouches, a 20-year-old bottle that still showed vibrant freshness and the stunningly focused cherry core that marks this wine in any vintage. The word mouches, French for flies, is – or anyway once was – local dialect for bees, which can be seen buzzing about the label. 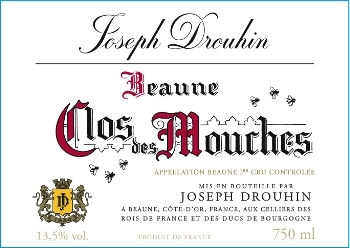 The Drouhin Beaune Clos des Mouches 2013 sells for about $89. Louis Jadot, also located in Beaune, may be Burgundy’s most diverse producer, a maker of superb wines great and modest from up and down the region’s appellations. Until recently, Jadot’s master winemaker was the affable Jacques Lardière, whose short-lived retirement ended recently when Jadot followed Drouhin into Oregon and induced Lardière to apply his touch to that project. A steady stream of Jadot Burgundy, both red and white, compliments meals in our home. But the most recent was about as good as it gets: Montrachet, that monument to all that Chardonnay can be, the super-delicious pinnacle of Burgundian white wine. We only drink the stuff once a year, for a birthday (not mine! ), and this time it was the 1995: a deep, lustrous golden-hued wine rich with honey, butter and melon. It does take the edge off getting older. 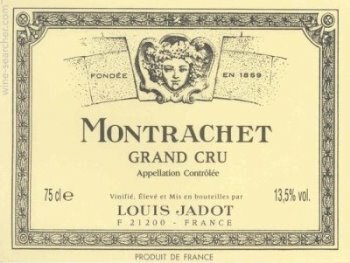 The Maison Louis Jadot Montrachet 2013 sells for about $450. Domaine Faiveley, which operates out of Nuits-Saint-Georges, is better known for its reds than its whites. In fact, I don’t recall ever drinking a Faiveley Chardonnay. But my cellar holds a wide assortment of Faiveley (pronounced Fev-lay) grand cru Pinot Noir, including bottles from the domaine’s wholly owned monopole in Corton with the very private moniker of Corton Clos de Corton Faiveley. There’s no doubting who owns those vines. But the wine that capped my négociant swing was a different grand cru, from a bit farther north: the 1988 Clos de Vougeot, one of the oldest Burgundy reds remaining in my cellar. In its aged grace and finesse, this wine reminded me of another Faiveley jewel, and another grand cru, the 1985 Charmes Chambertin, the last bottle of which, alas, we polished off many years ago. Such is Pinot Noir in its patrician glory. 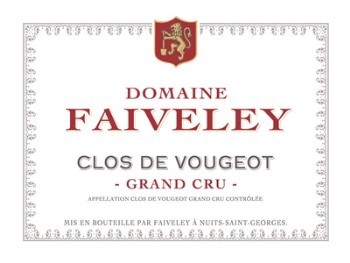 The Domaine Faiveley Clos de Vougeot 2013 sells for about $153.